They'll talk trade as NAFTA negotiations continue. Prime Minister Justin Trudeau is greeted by U.S. President Donald Trump at the White House in Washington on Feb. 13, 2017. 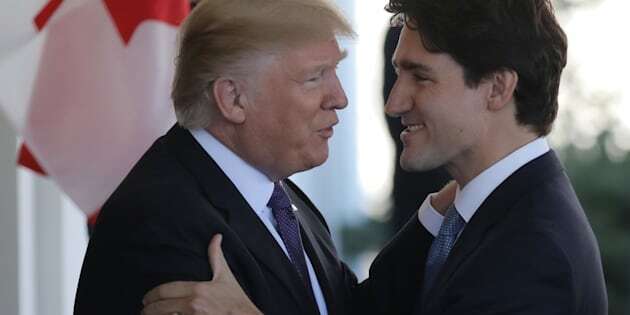 OTTAWA — Justin Trudeau will visit the North American capitals next week amid early signs of turbulence in continental trade negotiations that have stoked some concern from NAFTA supporters about the agreement's long-term prospects. Some officials have been unnerved by early sticking points that have emerged even before the negotiations touch the hardest issues: dairy, auto parts, the dispute-resolution system and the U.S. idea of forcing a mandatory review of NAFTA every five years. "Which is ridiculous,'' said an official in one of the other NAFTA countries. ''Things are going pretty badly,'' said Miller, head of the Rideau Potomac Strategy Group, which has advised different clients on trade issues, including Industry Canada. "Look into the into the eyes of the president and figure out if the U.S. is serious about getting a renegotiated NAFTA,'' Miller said. Foreign Minister Chrystia Freeland and U.S. Trade Representative Robert Lighthizer leave after the close of the third round of NAFTA talks in Ottawa on Sept. 27, 2017. "I'm not worried,'' the senator told The Canadian Press.